Bluetooth Lag: My Ouya bluetooth joysticks are slow to respond! Bluetooth lag is possible one of the most complained and criticized issues with the Ouya console. If you don’t have good joystick response time then your not a gaming console. Ouya could have done a slightly better job at giving the bluetooth controllers a larger antenna on the inside as they have the room for it. I have heard some people stating that they have to tip the Ouya onto its side in order to get better signal. If that is myth or not is to be debating, however tipping over your Ouya does not really hurt anything and if it works for you then good! If you have no network problems with a solid router that can push the wi-fi signal loud and clear. 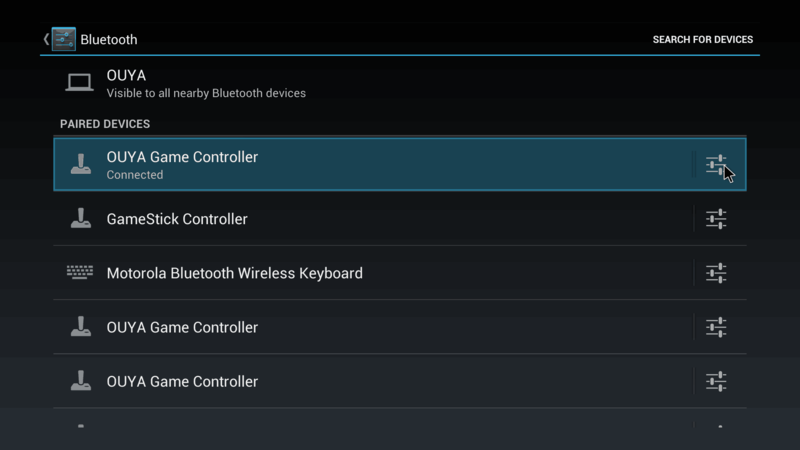 Then you can go into your MANAGE > CONTROLLERS > SETTINGS and check the box to always priorities Bluetooth over Wi-Fi (even with only a single controller connected) and see if that helps. As for why you have to do this? Well, Bluetooth and Wi-Fi are around the same frequency to the chance of cross-over interference is much higher. This is also why it states that people who are hard-wired into their Ouya via Ethernet will not experience any of these problems. If you are still experiencing lag issues with bluetooth it might be a Firmware issue with your controller. Allow me to explain the firmware versions to the best of my knowledge. Firmware 0x0101 – These were the first Ouya Dev-kit controller firmware. Firmware 0x0104 – These were the updated firmware that came with the Ouya black consoles and beyond. In firmware 0x0103 had issues transmitting enough power to the bluetooth antenna resulting in massive lag when connecting more the one controller up. 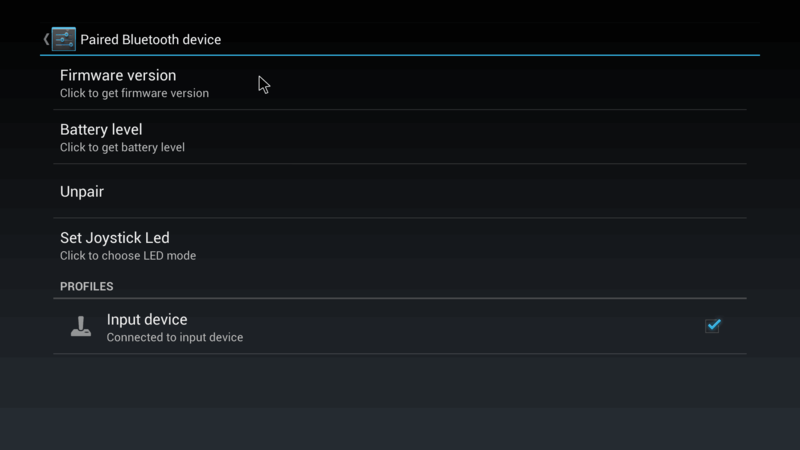 Go to Manage > System > Advanced > down arrow once to Bluetooth to click it and you will see the Android bluetooth pairing menu with all of the devices that you have connected. As you can see my Bluetooth pairing menu is rather busy! Using the mouse-pad on your Ouya Controller or a USB mouse connected directly to your Ouya, Mouse over the Icon that would represent your devices settings. If you clicked on the right icon you should get a screen like the one above talking about Paired Bluetooth device. If you click on the areas to check firmware version it should show the exact firmware of your controller. Also you can check the battery gauge in this menu however I am unsure as to how accurate its battery reporting system really is. If you have a older firmware version the only way to get it updated is by contacting Ouya Support and filling out a ticket to have your controller updated. As of the current date of this blog entry there is no way of updating the firmware through the I2C port underneath the right-hand plate of the Ouya. Many people have reported that after they had their controller updated from Ouya there has been a noticeable improvement in terms of responsiveness to their Ouya Control. I can state from my own experience that I can now link all 4 controllers without them lagging out too terribly when doing bombsquad matches and tournaments. At best guess the only thing the firmware update does is it helps hunt for bluetooth signals better as it changes its frequency to attain the best connection. This can happen if for some reason pairing between the Ouya was lost due 8to factory defaulting your console or possibly the controller had its battery left out for a while. It can even happen to other environmental factors such as a laptop with a activly sniffing bluetooth chip taking control of the joystick! Sometimes its to simply break the pairing with one Ouya so you can move it over or another. First, press the “U” Button in the center of your controller under the two middle lights (player 2 and player 3) are flashing. If you cannot get the LEDs to flash then there is one of two possibilities. Battery Issue – Either the batteries have been depleted to the point where it can no longer engage the Bluetooth circuit. Or it’s not making connection which can be possible with certain models of rechargable batteries. Controller issue – If you have verified that your batteries are good either via volt meter or by simply plugging those batteries in something else. Then there could be a problem with the controller circuit itself. In which case if your Ouya is within the 1 year warranty period you can process the controller. Only do this after you have tried different batteries and hold down the “U” center button down for 4-5 seconds. If you DO get the flashing two lights but still no pairing then continue onward! Using either a USB connected mouse or a USB connected keyboard with arrow and enter keys for navigation; Go to MANAGE > CONTROLLERS > PAIRING and re-try the pairing process by holding down the middle “U” button to get player 2-3 flashing. Let it go and it should with with and attempt to pair with your Ouya. 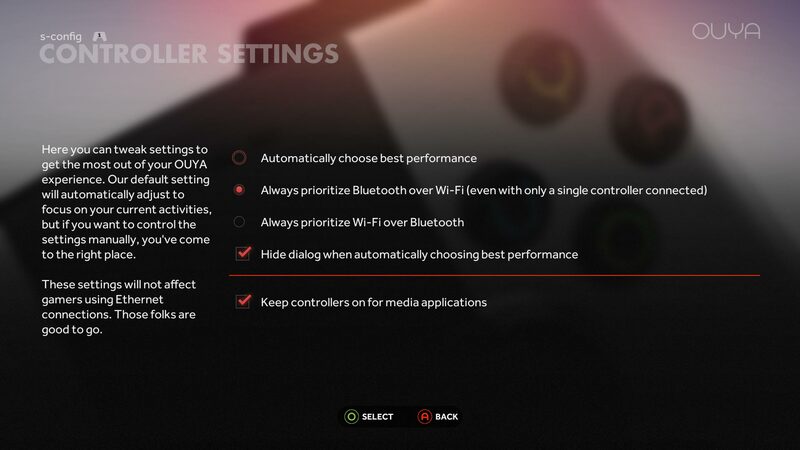 If that doesn’t work you can either press “Y” to go to your Bluetooth settings from this menu or you can go from the main Ouya menu MANAGE > SYSTEM > ADVANCED and select Bluetooth from there. 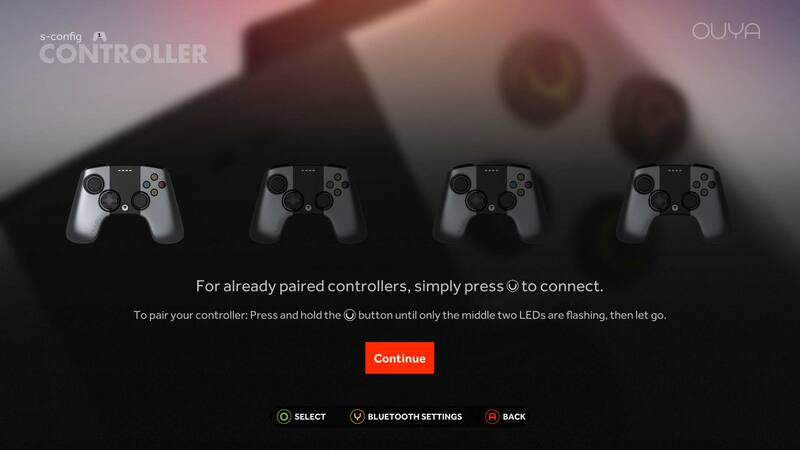 Scan your devices in the upper right-hand corner just like pairing a third party controller and see if the Ouya can be paired. If this does not work or you have no lights on your controller and you know you placed a good set of batteries into the controller. Then you may either have a defective controller, or a defective Bluetooth receiver on your Ouya. If possible try another Bluetooth device as described in the lower section of the blog such as a Bluetooth keyboard, phone, speaker, or any device which is capable of pairing. On certain devices like phones the Ouya can technically connect to it but it will not know what to really do with it. But at least then you have eliminated the fact that your console is defective. If you are stuck on a purple screen asking to pair a controller. You may have to use a PS3 or Chinese P3 controller to plug it directly into the USB port and get past this screen. This is an old Abominable Snowman screen and shouldn’t appear after you update your Ouya. In general the Anthracite Ouya console does not suffer from the bluetooth lag because the wi-fi chip inside is slightly different then the original Kickstarter/Retail Ouya Consoles. If you have one of the dark grey Ouyas and it’s an Anthracite you may notice that upon going into MANAGE > SYSTEM > ADVANCED and select Bluetooth you will quickly find out that you cannot turn on your bluetooth controller. that it keeps says the error “Bluetooth turning on” but never goes past that screen. This is because for some reason the tables for bluetooth devices gets corrupt and the best solution in this case is to simply factory reset your Ouya to clear those tables. I just encountered an Ouya like this in my Six Ouyas blog entry. Using a stock Ouya with a 0x0103 model joystick after software loading the Cyanogen OS onto the Ouya has also been reported to make bluetooth lag go away. 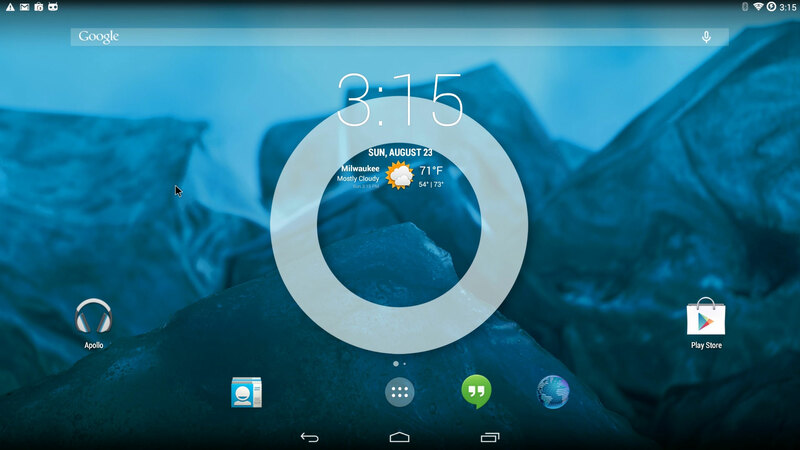 This could be because of the updated drivers in android 4.4 which many of the modern android gaming consoles use as well.